The Yorkshire Linen Co has become the newest backer of one of the country’s most unusual yearly events. The business – which owns and runs more than 40 stores in the North of England, Spain and Portugal – is sponsoring the Great Knaresborough Bed Race, being held in the market town on Saturday, June 8. This year the race, which regularly attracts around 20,000 spectators, will see 90 teams pushing specially-made beds around a gruelling two-mile course, which includes crossing the River Nidd at Conyngham Hall. The theme for this year’s event, the 48th annual race, is Myths and Legends and, ahead, of the race, all the teams will parade through the town in fancy dress costume. We are delighted the Yorkshire Linen Co has come on board as our newest sponsor. The truth is without sponsors the race simply wouldn’t happen. This year theme is ‘Myths and Legends’, a nod towards the town’s involvement in numerous tales of the unexpected – and the unexplained!The Great Knaresborough Bed Race is one of the largest community events in the north of England and attracts media coverage from all over the world. One of the great attractions for the large number of spectators who flock to the town for Bed Race day is the sheer quality, imagination and variety of the dressed beds and teams. The marching bands, dance groups and supporters create a carnival atmosphere to this wonderful day. This year we are celebrating our 20th anniversary, and as such we were looking for an opportunity get involved with a major, local, event. Our business is best known for selling bedding, so what better fit can there be than getting sponsoring the Great Knaresborough Bed Race. 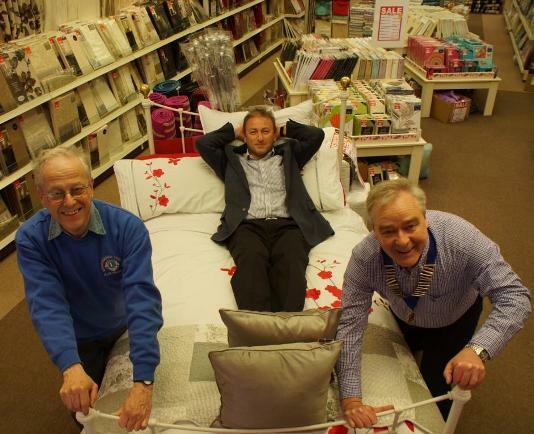 Alan Walgate (left) and Nigel Perry (right) from the Knaresborough Lions showing new sponsor, The Yorkshire Linen Co’s Ross Leventhal, how bed racing is done!